An industrially viable synthesis of racemic 3-quinuclidinol under solvent free conditions, a key intermediate of 3-R-Quinuclidinol (R-1-azabicyclo[2,2,2]octan-3-ol) is used as a building block in the synthesis of muscarine M1 and M3 agonists as well as for muscarine M3 antagonists has been described. The quinuclidine ring is used in synthesis of various therapeutically important molecules and also important intermediate and synthesis of some drugs like azasetron, benzoclidine, palonosetron, solifenacin, cevimeline, quinupramine etc. and also found in a number of natural products . The quinuclidinone derivatives have been reported to show various biological activities [3-6]. Quinuclidinone derivatives are reported to show anti-cancer [7,8], anti-inflammatory , central nervous system stimulating activity  and antihistaminic activity  (FIG. 1). 3-R quinuclidinol  can be obtained by kinetic resolution of racemic mixtures of R- and S-3-quinuclidinol  (FIG. 2). 3-R-Quinuclidinol(R-1-azabicyclo[2,2,2]octan-3-ol)  is used as a building block in the synthesis of muscarine M1 and M3 agonists as well as for muscarine M3 antagonists. See for example the recent review by Broadley and Kelly  concerning muscarinic receptor agonist and antagonist. Talsaclidine fumarate (WAL 2014 FU) , cevimeline HCl  and YM 905  are all examples of products where 3-R quinuclidinol  constitutes an integral part of the molecular entity. These products have shown potential in the treatment of Alzheimer’s disease, sjogren syndrome, and urinary incontinence, respectively. 3-R quinuclidinol  consitutes therefore a highly valuable building block for the synthetic production of several important pharmaceutical chemicals (FIG. 2). Figure 2: Synthesis of 3-R quinuclidinol. The reported synthesis [16-18] of racemic quinuclidinol (FIG. 3) involved the use of large amount of solvents such as toluene, benzene, isopropyl alcohol, ethanol, acetone, methanol and con HCl. Both the reagents and solvents have to be handled in large volumes because the product has to be produced commercially. This process was difficult to implement at the production scale because they require costly solvents and tedious isolation procedures. Figure 3: Synthesis of Racemicquinuclidinol. Keeping these points in mind, we designed three-stage green process of racemic quinuclidinol. Two of them were completely under solvent free conditions. Minimum amount of solvents were used and recovered in third one. Our synthesis is depicted in FIG. 4. As a result of these changes, the solvent usage was decreased, resulting in a significant reduction in the cost of racemic quinuclidinol production. 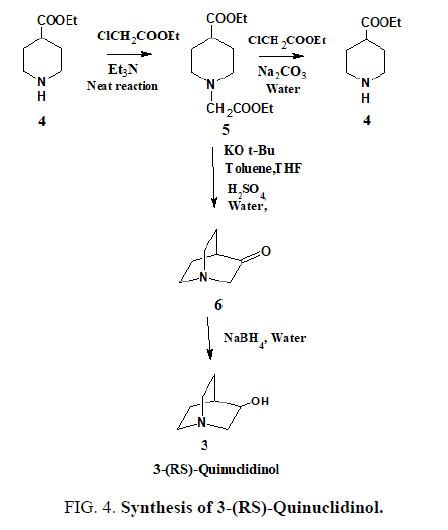 Figure 4: Synthesis of 3-(RS)-Quinuclidinol. Solvents were dried over sodium sulfate and freshly distilled prior to use. 1H NMR spectra were recorded on a Brucker ADVANCE-400 MHz, using CDCl3 as Solvent and TMS as internal standard. Infrared spectra were obtained on a Perkin Elmer spectrum 100 FT-IR spectrophotometer. Electrospray ionization mass spectroscopy was performed using an ion trap mass spectrometer (Model 6310 agilent). Gas chromatographic analysis was performed using a Shimadzu GC-2010 Plus equipped with an Alltech poly (dimethoxysiloxane) 30 meter capillary DB-1 column. To a solution of Ethyl isonipecotate (4), (10.0 g, 0.063 mol), and Na2CO3 (10.1 g, 0.095 mol) in water (30 ml) at 30ºC to 35ºC, ethyl chloroacetate (9.2 g, 0.075 mol) was added in dropwise over 10 min. The reaction mixture was stirred for 4 hr at 80ºC to 84ºC. Completion of reaction was monitored by gas chromatography (GC). The reaction mixture was diluted with water (60 ml) at 35ºC to 40ºC and stirred for 1 hr at 40ºC. The aqueous and organic layers were separated and the organic layer was washed with water (60 ml). The traces of ethyl chloroacetate were removed under reduced pressure to give the pure product 14.4 gr (93.0%), as yellowish oil. To a solution of Ethyl isonipecotate (4), (10.0 g, 0.063 mol), and triethylamine (9.6 g, 0.095 mol) at 30ºC to 35ºC, ethyl chloroacetate (9.2 g, 0.075 mol) was added in drop wise over 10 min. The reaction mixture was stirred for 4 hr at 60ºC to 70ºC. Completion of reaction was monitored by gas chromatography (GC). The reaction mixture was diluted with water (60 ml) at 35ºC to 40ºC and stirred for 1 hr at 40ºC. The aqueous and organic layers were separated and the organic layer was washed with water (60 ml). The traces of ethyl chloroacetate were removed under reduced pressure to give the pure product 14.7 gr (95.0%), as yellowish oil. A solution of 1-carbethoxymethyl-4-carbethoxypiperidine (5) (20.0 g, 0.082 mol) in tolune (10 ml) was added dropwise to a Potassium tertiary butoxide (14.0 g, 0.125 mol) in toluene (50 ml) and THF (5 ml) at reflux over 3 hr, and the mixture was stirred at reflux for 3 hr. Dilute sulfuric acid(13 ml in 40 ml water) added drop wise to a reaction mass at 500C and stir for 1 hr. Collected aqueous layer and heat to reflux and maintain for 6 hr. Then the PH of the mixture was adjusted with 50% sodium hydroxide solution to 10.5 at room temperature and stirred for 1 hr. Extracted the reaction mass with chloroform (3 X 500 L), organic layer was dried over sodium sulphate and distill off solvent under reduced pressure to give crude 3- quinuclidinone base. This product was purified by hexane to yield 7.0 g (69.0%) of a white crystalline solid, MP. 136-140oC, lit.16 140oC. 1H NMR: δ 1.6-2.0 (4H, m), 2.3 (1H, m), 2.6-3.0 (4H, m), 3.2 (2H, s); MS (ESI): m/z 126 (M+H). To a solution of Quinuclidinone (6), (10.0 g, 0.08 mol) in water (30 ml) at 30ºC to 35ºC, sodium borohydride (1.5 g, 0.04 mol) was added in lot-wise over 1 hr. The reaction mixture was stirred for 4 hr at 30ºC to 35ºC. Completion of reaction was monitored by gas chromatography (GC). Extracted the reaction mass with chloroform (3X50 ml), organic layer was dried over sodium sulphate and distill off solvent under reduced pressure to give RS-3-quinuclidinol crude. This product was purified by acetone to yield 9.0 g (89.0%) of a white crystalline solid, MP. 221-224oC., lit16 220-222◦C. 1H NMR: δ 1.25-2.0 (5H, m), 2.50-2.90 (5H, m), 3.05 (1H, m), 3.75 (1H, m, CH-OH); MS (ESI): m/z 128 (M+H). 1-Carbethoxymethyl-4-Carbethoxypiperidine  is manufactured in a two-type of reaction process as shown in scheme 3. Ethyl isonipecotate  was alkylated with ethyl chloroacetate in the presence of base potassium carbonate or triethylamine in water or without solvent to give the 1-Carbethoxymethyl-4-Carbethoxypiperidine  in 97% yield. This 1-Carbethoxymethyl-4-Carbethoxypiperidine  was cyclized to keto-ester in presence of potassium-tert-butoxide and minimum usage of solvents. The keto-ester was saponified and decarboxylated on heating with aqueous sulphuric and 3-quinuclidone  was isolated and further reduction with sodium borohydride in water to give of racemic quinuclidinol . The authors are thankful to Auroido Pharma Limited for financial assistance. Mazurov A, Klucik J, Miao L, et al. 2-(Arylmethyl)-3-substituted quinuclidines as selective a7 nicotinic receptor ligands. Bioorg Med Chem Lett. 2005;15:2073-7. Kaufman TS, Rúveda EA. The quest for quinine: those who won the battles and those who won the war. Angew Chem Int Ed Engl. 2005;44:854-85. Yang D, Soulier JL, Sicsic S, et al. New esters of 4-amino-5-chloro-2-methoxybenzoic acid as potent agonists and antagonists for 5-HT4 receptors. J Med Chem. 1997;40:608-21. Bös M, Canesso R. EPC-Synthesis of (S)-3-Hydroxy-3-mercaptomethylquinuclidine, a Chiral Building Block for the Synthesis of the Muscarinic Agonist AF 102B. ChemInform. 1994;25. Trost BM. On inventing reactions for atom economy. Acc. Chem. Res. 2002;35:695-705. Frackenpohl J, Hoffmann HM. Synthesis of Enantiopure 3-Quinuclidinone Analogues with Three Stereogenic Centers:(1S, 2R, 4S)-and (1S, 2S, 4S)-2-(Hydroxymethyl)-1-azabicyclo [2.2.2] octan-5-one and Stereocontrol of Nucleophilic Addition to the Carbonyl Group. J. Org. Chem. 2000;65:3982-96. Bykov VJ, Issaeva N, Selivanova G, et al. Mutant p53-dependent growth suppression distinguishes PRIMA-1 from known anticancer drugs: a statistical analysis of information in the National Cancer Institute database. Carcinogenesis. 2002;23:2011-8. Bykov VJ, Issaeva N, Shilov A, et al. Restoration of the tumor suppressor function to mutant p53 by a low-molecular-weight compound. Nat Med. 2002;8:282. Warawa EJ, Mueller NJ, Jules R. Quinuclidine chemistry. 2. Synthesis and antiinflammatory properties of 2-substituted benzhydryl-3-quinuclidinols. J Med Chem. 1974;17:497-501. Warawa EJ, Mueller NJ, Gylys JA. Quinuclidine chemistry. 3 beta.-cis-2-(4'-Chlorobenzhydryl)-3-quinuclidinol, a new central nervous system stimulant. Importance of the benzhydryl configuration. J Med Chem. 1975;18:71-4. Gonnot V, Nicolas M, Mioskowski C, et al. Expedient synthesis of mequitazine an antihistaminic drug by palladium catalyzed allylic alkylation of sodium phenothiazinate. Chem Pharm Bull. 2009;57:1300-2. Broadley KJ, Kelly DR. Muscarinic receptor agonists and antagonists. Molecules. 2001;6:142-93. Roman G. Perspectives in the treatment of vascular dementia. Drugs Today. 2000;36:641. Messer CJ, Eisch AJ, Carlezon Jr WA, et al. Role for GDNF in biochemical and behavioural adaptations to drugs of abuse. Neuron. 2000;26:247-57. Sternbach LH, Kaiser S. Antispasmodics. I. Bicyclic basic alcohols. J Am Chem Soc. 1952;74:2215-8. Langlois M, Meyer C, Soulier JL. Synthesis of (R) and (S)-3-Aminoquinuclidine from 3-Quinuclidinone and (S) and (R)-1-Phenethylamine. Synth Commun. 1992;22:1895-911. Y Soni J, Premasagar V, Thakore S. An improved and simple route for the synthesis of 3-quinuclidinone hydrochloride. Lett Org Chem. 2015;12:277-9.